On Tuesday, November 18, 2008 Kondañña (Barry Kapke) died from colon cancer. 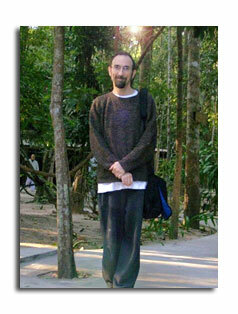 He was one of the early Abhayagiri monastery supporters and was instrumental in creating both the Upasika Program and the original Abhayagiri website. He was also the creator of one of the first Dhamma websites in 1991, originally called DharmaNet International, and he was also an Abhayagiri lay minister, having completed the CALM Program (Community of Abhayagiri Lay Ministers) training. A memorial celebrating Kondañña’s life also took place on December 7 at Abhayagiri — he will be greatly missed. In 1991, Kondañña founded DharmaNet International. Originally, DharmaNet was an international network of BBS operators, making use of electronic mail to discuss Dharma and to publish electronic Dharma books and the e-journal Gassho. As DharmaNet grew, the technologies of the Internet became more and more central to DharmaNet's mission: helping people anywhere in the world to find access to Dharma teaching and teachers, and to explore uses of technology to support Dharma practice. DharmaNet's Gateways to Buddhism was one of the first to pioneer use of the World Wide Web as an informational clearinghouse for Buddhist resources. DharmaNet remains the most important central resource for Buddhist information of all traditions. Kondañña felt strongly that DharmaNet be a prominent model of dana and is offered freely in the Dhammic principle of supporting that which is worthy of support and refraining from supporting that which is not worthy of support. Kondañña's own practice is Theravadin, in the Forest Monastic tradition of northern Thailand. He is closely associated with Abhayagiri Buddhist Monastery in Redwood Valley CA and is a founder of the Sanghapala Meditation Group which meets weekly in Berkeley. He has been trained as a Community Dharma Leader by Spirit Rock Meditation Center and is ordained as a lay minister through the Abhayagiri community. It's getting difficult for me to write these days. I seem to fall asleep almost anytime I'm not moving, so in the morning my routine of reading my email becomes quite challenging. I sit down and log in (we have a new system here requiring you log in and it logs out during periods of inactivity - much like me) and while I'm waiting for the system to do that I fall asleep. I wake up and realize I've been asleep so I look to see whether I'm logged in or whether I slept long enough that I was logged out. So then I start to read an email and fall asleep. This goes on and on for quite some time. I'm finding that the "sleep" state" and waking state are getting more and more indistinct. I wake up up in the midst of movements from the dream state - reaching for something, stroking my cat, making some sort of computer input, etc. It takes me several moments to become cognizant of whether I'm awake or in some "other' consciousness. It makes it hard to write but it's making it hard to do many things. Maybe death is getting closer. They say sleeping more is a sign of impending death and I definitely seem to be sleeping more than I ever have and I have a really hard time coming into a waking state. It's like sleep (or whatever this other mind-state is - it seems to be somewhat lucid so I'm not sure that it's really sleep) has some magnetic pull sucking me in and requiring an exertion of will to resist its pull. I think of being a child and being really tired and fighting so hard to stay awake but the eyelids are so heavy and the urge to sleep is so compelling - even though the will is determined to stay awake. Usually sleep wins these childhood contests. It's kind of like that for me now, many times during the day. The more active I am the more I can stay awake. So anyway, this is a new development and I've been trying to be very curious about it, to investigate as best I can what is this "other" mind-state, what are it's characteristics, etc. And I also investigate the thought "Is this death coming closer and beginning to take me away?" and how do I feel about this. It's an interesting time. I also seem to be losing much of my drive and my hope. I think returning to America will be hard on me psychologically - and the climate will be hard on me too on all levels - and I probably will begin to decline more rapidly. Unless I should find a love there, which I doubt, I suspect death will come soon. There's not much for me in America to live for anymore and now I'm giving up my independence, living in someone else's space and under their "rules." I can't imagine I'll be able to thrive under such conditions. Physically I still feel fine. Morphine keeps me in a relative state of comfort and functionality so I really would stay here in Thailand if it weren't for this new symptom of lapsing into unconsciousness (or "other"-consciousness) with little control. I'm afraid of it getting to a point where I wouldn't be able to travel. So soon - in a matter of weeks - I’ll be returning to America. To what, I’m not sure. I'm a kind man who tries to make the world a better place - and himself, a better person. I have a strong body, a positive spirit, and a bright mind. I am a teacher, a writer, and an artist. I am well-educated, creative, and have a good sense of humor - sometimes a quick wit, sometimes silly. I am responsible, reliable, and honest. At the same time, I am independent and tend to think and live "outside the box." I adore cats. I lived for over a year in Thailand, which is where my heart is, but health matters have forced me to return to San Francisco. I am not all that concerned with money but quality of life is very important to me. I value friendship and truth. Life is short and I want to live it well. The following letter was written by Rachel Starbuck, a student of Kondañña’s, and was sent to Dennis Crean. The letter was read out at the memorial service held for Kondanna on December 7. Kondañña was my teacher. I now live in Taiwan, so I will not be able to join you at the memorial, but I wish I could be there. 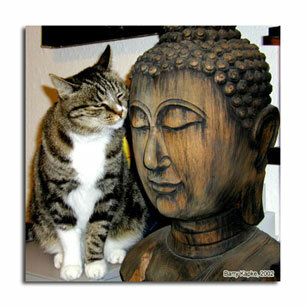 I had the good fortune to study shiatsu with Barry at the San Francisco School of Massage. He really did teach bodywork as nothing less than a spiritual practice. He said: The heart of our work is simply to offer our presence. Don't push, just use the weight of your own body; don't diagnose, just be aware; don't try to help, but also don't turn away—just be with the person, that's all you have to do. And Barry really practiced what he preached. You could see it clear as day, watching him work. It was an amazing and beautiful thing. 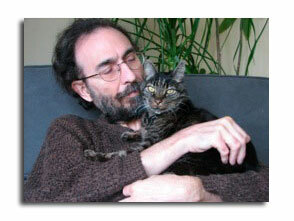 When I attended my first week-long silent retreat at Spirit Rock, Barry was there too. The retreat wasn't easy for me, and on the last day I felt quite overwhelmed. I couldn't stop the tears streaming down my face even when it was time for lunch. I remember standing in line, holding my plate, weeping and embarrassed to be weeping, thoroughly miserable. I took my food to the farthest corner of the farthest table and sat down, but I was too upset to eat. Then I noticed that someone had come to sit with me. It was Kondañña, Barry. He didn't say anything, he didn't do anything, he didn't even look at me. He did exactly what he always taught us to do—he just sat there, slowly eating his lunch, being with me in my suffering, neither trying to help nor turning away. But it was so profoundly comforting to me, even now tears come just to think of it. Some years later my sister was birthing her first child at home and I was there to assist her. I had taken a special class on massage for birthing mothers, but once my sister's labor had started she couldn't stand for anyone to get near her, much less touch her. All she did was scream and scream and there was nothing we could do. Then I remembered what Barry had showed me. I sat down next to her on the floor. I didn't say anything, I didn't look at her, I didn't touch her. I just sat there with her while she suffered through her labor pains, neither trying to help nor turning away. I don't know how long we sat together like that. But later, after her son was born, she told me how profoundly comforting it had been for her, how my just sitting there had somehow allowed her to relax and feel less afraid. Now Kondañña has died. But what he taught is still moving through those of us who learned from him. Now when I see my sister quietly holding her son after a bad dream, neither trying to help nor turning away, and then I see the comfort he feels as his little body starts to settle and relax, then I see Kondañña's work, alive. Thank you for giving me the opportunity to tell this story. I truly wish I could be at the memorial service to express the deep gratitude I feel for Kondañña's presence in my life.